Remedia is an organization that has grown out of about 4 years of work in southern Belize by our friend Jillian DeGezelle. An ethnobotanist in training, Jillian has been working with Maya and Garifuna healers exploring traditional medicinal approaches to women's health issues. Over the years, different ideas for projects have come up, so Jillian formed Remedia to try to raise funds for such. Having worked with Jill in the past, and having conducted my MA and MPH thesis work in southern Belize, Remedia seemed like a good fit for me, and there was a spot to step in and help get the organization rolling. We're still in our infancy, but there are a bunch of things already happening. 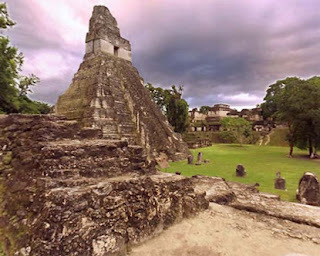 One such project is a trip to the ruins of Tikal in Guatemala for the annual Maya Day Celebration. Maya Day is a new aspect of a growing pan-Maya movement in which Maya from throughout the region converge at Tikal for a reclaiming of Columbus Day - a signal that over 500 years of oppression and exploitation is coming to an end. A small group of Q'eqchi' Maya healers requested that we (Remedia) accompany them to the celebration, and film the journey. Jillian is currently in Belize, and I will be headed down shortly to join her and the healers for the trip to Tikal. We'll be twittering about the project as often as possible, and will have blog posts and pictures and video on the Remedia site as soon as we can. I will also post occasional updates about the happenings at Remedia here on Recycled Minds. Thanks for your interest! It's so awesome that you get to experience the Maya Day celebrations. Sounds like it will be amazing and momentous! I look forward to following your journey in Guatemala and with Remedia!